The Pyramid of Fire is an unknown Aztec Codex (hieroglyphic manuscript) which was most probably painted in the last half of the fifteenth century. The content of the codices was more varied than the existing examples seem to indicate, the great majority being ritualistic and divinatory. 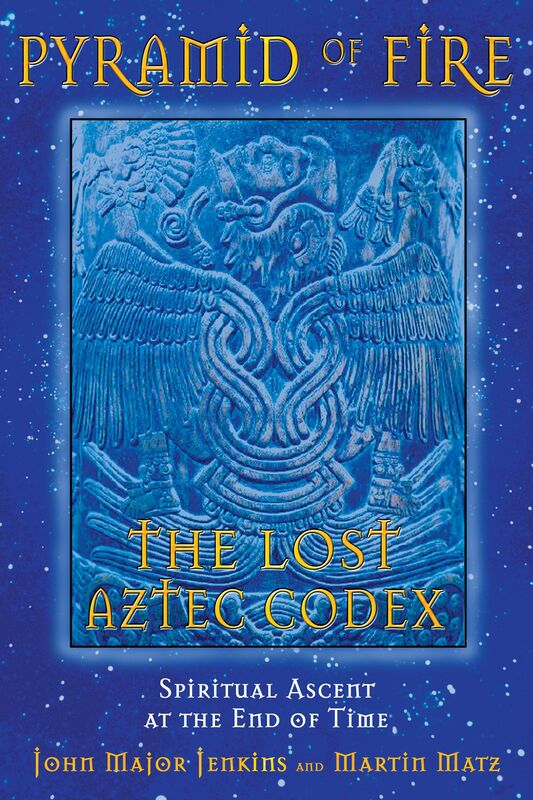 The Pyramid of Fire belongs to this group of divinatory codices which were called in Nahuatl (the language of the Aztecs) tonalamatl--the book of the days. These books were all calendars consisting of 260 days. The number 260 was arrived at by combining 20 day signs with 13 numbers. The tonalpohualli guidebook was used to determine whether a day would be fortunate or unfortunate. We will return to this subject in greater detail later in this book (see the calendar section of the novella in chapter 4). The Pyramid of Fire, however, is much more than just a divinatory calendar. It is an American version of the Perennial Philosophy which I will compare to the Kabbalah, alchemy, Western astrology, Hermetic philosophy, the teachings of Gurdjieff, and the Tarot in order to show that all occult knowledge stems from a single source. Since Asia and Europe are a contiguous landmass, no one disputes the idea that by means of travel, trade, and conquest the great civilizations of the ancient and classical world influenced each other. Therefore, it is not so surprising to find the Perennial Philosophy expressed in various forms even in such geographically distant locations as China, India, Egypt, the Middle East, Greece, and Rome. In the Americas, we have a different situation entirely. Archaeologists have steadfastly insisted that the high cultures and great civilizations of the New World developed independently, that is to say, without contact or influence from any other people. This completely erroneous theory of independent development has been taught as absolute truth throughout this century. The codices were mnemonic devices (memory aids) for recording all the sciences and wisdom of which the Aztecs had knowledge. The tlamatinime (the “knower of things”) were wise men, those initiated into the occult knowledge, and were responsible for composing, painting books, knowing and teaching the songs and poems in which were preserved the Aztec sciences, wisdom, and mysteries. The Aztecs found in the rhythm of poetry an easy and accurate way of remembering the meaning of the hieroglyphs inscribed in their manuscripts. It is impossible to overemphasize the importance of poetry in shaping the forms and thoughts expressed by the high cultures and great civilizations of ancient America. Without knowledge of what the Aztecs called “flower and song” (poetry), we can neither understand nor appreciate the true greatness of their achievements. The Perennial Philosophy has appeared and reappeared in various guises and been expressed in numberless ways throughout the ages. Nowhere, however, has the secret knowledge been presented in so aesthetically pleasing a manner or reached so high an artistic level as it does in The Pyramid of Fire. The power of the poetry used to express the Perennial Philosophy makes this codex unique in the realm of occult literature. 1 In the heavens over the Earth sails Tecciztécatl, He of the Marine Conch (the Moon), and Tonatiuh, the Sun. The Earth and all its creatures are under their power. 4 On the Earth exists the worlds of nature: the informal life of waters, trees, insects, animals, and two classes of men. One class is the ordinary man, naked, inert, always menaced by death’s darts. The other class is the superior man. In the shade of the altar the maguey spines of penance become for him the wings of the soul and in his hands he harmonizes the four states of matter. He has achieved consciousness. He has achieved the power of Truth and can act. He is! 17 The other man is like an agonized animal, tied to the tree from which he eats. He gives his vital energy to Tecciztécatl, the Moon, While his body is eaten by Tlaltecuhtli, the Earth. So everything devours and is devoured, eats and is eaten in the cosmic hierarchy. Plants eat from minerals and are eaten by animals. The animals eat plants and in their turn are eaten by the Earth. So does man, as animal organism, devour plants and is devoured by Earth in due time. 27 And if he is only body, he has no other destiny. But the superior man feeds on sacrifice; he develops his soul and his soul becomes food for Tonatiuh, the Sun. So, as the maguey spines rest on the straw bed, the soul of the liberated man rests on the Hill of Heaven. 6:1–6. The sun and the moon rule over Earth. The various domains of nature include two classes of men, which can be stated simply as “conscious and unconscious,” or “internally oriented” and “externally oriented.” The externally oriented man is lost in the world of appearances and cannot see the essence within that connects all phenomena and defines all relations. The “superior man” is on a path of deepening insight, and utilizes penance and sacrifice to open the “wings of the soul.” This teaching sounds undesirable to a culture that values hedonism, but is in fact consistent with many spiritual traditions. Psychologically speaking, personal sacrifice means the transcendence or “putting into perspective” of self interest, so that a higher truth can be served. It’s all about letting go, transcending the ego, and boundary dissolution. It isn’t about being holier than thou, a guilt trip, or penitential pain seeking, although disentangling oneself from ones addictions and immature desires can give rise to suffering. This is, however, a divine suffering that unfolds the wings of the soul. The wings of the soul is a metaphor often found in Nahuatl religious poetry. Later pages of the codex will clarify what it is. Martin Matz (1934-2001) was a poet/philosopher involved in the 1950s Beat movement. His published works include Pyramid of Fire, Time Waits and Pipe Dreams.